One of my favourite board games to play (with or without kids) is Carcassonne. I discovered this site – an unofficial one- that offers online version of different games. Note: to play you have to have at least version 1.2 of java. If you go to above sites FAQ section it will check to see if you have installed and direct you to site where you can get it. This is great game. I bought it after playing Settlers of Catan- which is just a tad too difficult for my 8 1/2 year old. I have to admit I really like the game, too. It was easy to learn- took about 10 minutes and playing was fun. You lay down tiles that build cities and roads, etc. At sleepover recently I played with other kids and they also really like it. We also bought the expansion pack. Princess and Dragon and too be honest this was bit too much. The rules suddenly got very complicated and the group got frustrated. I think with all the expansion packs maybe it becomes to cumbersome. I will say that it was much more affordable than Settlers of Catan ( which I think was a whopping 70.00) this game was closer to 30. Also very well made- wooden pieces for a change instead of cheap plastic. I HIGHLY recommend this game for ages 6 and up. Note: We were playing at Starbucks tonight and several familes stopped by to find out more about the game and where they could by- really is a good family game. This is a scaled down version of the game, Settlers of Catan. This version is for ages 4 and up. My almost 9 year old also enjoys. The premise is to get enough “supplies” i.e. grain, wood and bricks to build houses and town. Game is well made with wooden pieces, by Mayfair Games. It is pricey- was 60.00 Canadian. So far it has been worth investment from a homeschool point of view- and big points because I can play without losing my mind! Board Game: Settlers of Catan by Mayfair Games- A GREAT Homeschool Game! Another great find. Along with Blokus this has become a real favourite. Settlers of Catan Board Game is a board game that focuses on discovery and the building of a society. It is easy to learn how to play- took about 15 minutes- but tricky to play. Recommended age is 12+ years. I do know some families who play with 7/8 year old with a modified version- cards are all face up. The game is pricey- 60.00 Canadian. The toy Store we bought it at had about a zillion expansion packs, Seafarers of Catan: Expansion Game of Seafaring, Exploration, and Trade, Cities & Knights of Catan Game, Settlers of Catan: 5-6 Player Expansion, The Settlers of Zarahemla. I would really like to try this one out , Settlers of the Stone Age Game. 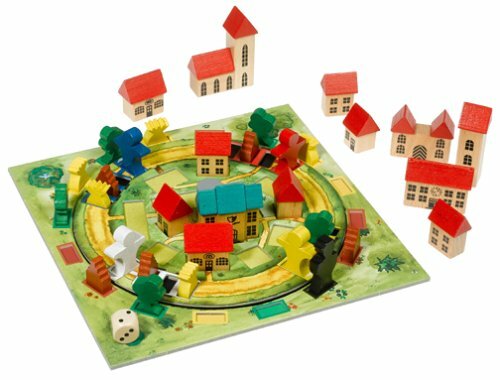 They also make a version for younger kids that I am going to but and try- its called , Kids of Catan. It looks really nice- for about 4+ years. Made of wooden pieces that represent a wagon and different resources like wood, bricks, and wheat. Looks like something my 9 year old and 3 year old might be able to play together with us. There are a lot of reasons why this is a great game. It is fun. It’s challenging. A game can be played in under 1/2 hour. You do not need to read so younger children can play. It requires spacial skills as well as some planning and strategy. The game is played by placing pieces on board and trying to block your opponent from placing all their pieces on the same board. The game is fairly expensive- almost 40.00 Canadian. You can also buy at Amazon ( click on image below) for 29.99US. It has one a ton of awards and appears in alot of homeschoolers game shelf. The Blokus site does has online Blokus version to play. My daughter and I have become addicted. My 2 year old can be involved buy sorting colours and pieces. It is a nice winding down game- not too aggressive. One of the great things about playing games is not just the game play but also the conversation. They provide a way to stay connected with your children- talking about their day and their thoughts and fears. I learn more about E. playing a quiet game than I do sitting her down and trying to have a ” talk” . Check out this game- try it online or borrow from a friend- it is worth the investment and has excellent play value!